!MY DRAWINGS ARE NO LONGER FOR SALE! The project designated as Engels E1 is an attempt to create a reproduction of the famous Fokker Dr.I of 1917 in an as authentic way as possible. The aircraft will eventually be part of our Flying Museum Dream project. To see the sample drawings, click at them. Thank you very much for your interest in our ENGELS E1 project. The FOKKER-TEAM-SCHORNDORF did develop a complete set of construction drawings for this aircraft. The ENGELS E1 is a reproduction of the Fokker Dr.I. It was originally designed in 1917 under the supervision of Mr. Ing. M�ser (not as usually thought by Reinhold Platz) at the Fokker Flugzeugwerke G.m.b.H. Schwerin/Mecklenburg for use as a small manoeuvrable dog fight single seater. As you can judge from the enclosed sample drawings, our drawings are documents of the highest German standard qualityt. The drawings set available from us is based on the results of long yeared historic researches and redesigning of that type. Every little detail was checked several times by us about being historic correct. Further similar aircraft by the same designer which are today preserved in museums world wide have been carefully measured, photographed and studied. Here are planes like the Fokker E.III, the Fokker D.VII or the Fokker D.VIII. 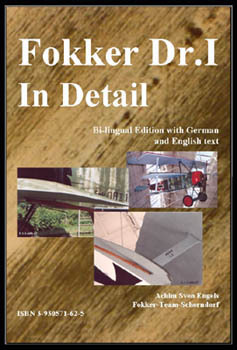 Since no complete original set of construction drawings did survive until today (as far as we can accertain), the redesigning is based upon the above mentioned comparison with other Fokker types and their measurements as well as on many small parts of original Fokker works drawings, documents of the Prussian Army, sketches, texts and countless historic photographs (see Archive of the F-T-S). The research department of the Fokker-Team-Schorndorf did carefully work from the point of view of the historian and not from the commercial one. The drawings have been also made in this way by us. !! !NOTHING HAS BEEN KNOWINGLY REMOVED, ADDED OR CHANGED!!! Furthermore you will support further historic researches by the Fokker-Team-Schorndorf through the purchase of these documents. The sample drawings which are attached to this information sheet do perfectly show the quality of the prints which speaks for themselves. Wherever possible the separate parts have been drawn in 1/1 scale. The sizes of the sheets of the set differ between Din A4 and Din A0. Most of the drawings are covered on Din A3 sheets. For better understanding drawings of single parts only do show one part. We have been endeavoured to keep alive the origin style of the drawings made at the Fokker Flugzeugwerke G.m.b.H. The scale of the shown parts differ between 1/20, 1/10, 1/5, 1/3 and mostly 1/1. The set includes several big sheets in large size. One of them shows for example the fuselage frame in 1/5 scale. All drawings will be delivered rolled unless otherwise requested. The complete drawing set consists of nearly 2000 drawings. World wide are today 10 triplanes constructed from our manufacturing documents. Two of them in Germany and five in Europe. The others overseas. Most of them will be airworthy. However you may decide, we whish you that you will be able to turn your will into a fact and all the luck and all the fun during construction. No phone! Don�t call me! I am not a telephone person. Send e-mail, please! Some photographs of our triplane projects. The very first Engels E1. Built by Achim Engels at the age of 17-19. The aircraft still shows a number of historical inacuracies. Today it is on display at the technical museum of Speyer on the Rhine. The drawings for this plane experiences many modifications and corrections since that time. The first Engels E1 after it was handed over to the Museum in the year of 1993. At this second replica of the Fokker Dr.I, the Fokker-Team-Schorndorf only worked up until this stage. The aircraft is owned by Michael Vogel. We do not know anything about the current stage of this project. The photograph was taken in 1998. At present I am working on a triplane for my own use. The aircraft is going to be certified in Germany as an "Experimental" aerobatic plane. The project was only recently registered with the German Authorities as a homebuilt. The powerplant will be a 9 cylinder rotary engine. Since this is a project that runs on the side line, progress is rather slow. Wing ribs are comming together in the wood workshop. The original design by Fokker did not have any filler blocks at the nose section. However for the Engels E1, I did not want to miss it, since it adds a lot of stiffness to the leading edge ply wood cover-rib joint and only adds little more weight. For your own motivation you require sometimes something to look at. For this reason I finished up the rudder for the triplane like if it was a Fokker made piece. All markings are applied by hand using templates to outline them. Control stick and torque tube. Axle boxes for the undercariage. Adjustable undercariage and center cabane strut attachment ball and socket joints. Ribs for the undercarriage wing like fairing. Some shots of the lower wing during making. Some shots during covering and painting of the lower wing. A simle load test demonstrates the strenght of the thread used to stitsch the fabrics to the structure. Hand stitching on the ribs. The trailing edge is being stitched to the trailing edge wire. The bottom side of the lower wing is covered. Pre shrinking with water before the febric gets doped.